Forty million people are living with HIV today. AIDS has killed an estimated 25 million people since it was first recognized in 1981. 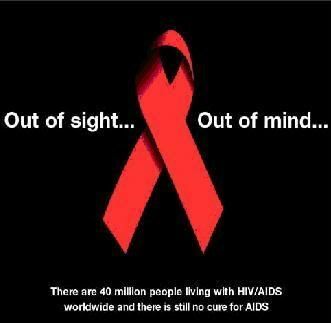 In 2005, AIDS killed an estimated 2.8 million people. More than half a million were children. There is no known cure or vaccine. The red ribbon is worn as a sign of support for people living with HIV. Wearing a red ribbon is a simple and powerful way to challenge the stigma and prejudice surrounding HIV and AIDS that prevents us from tackling the global epidemic. Light a virtual candle. 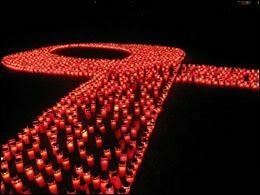 A dollar is donated to the National AIDS Fund for each one lit....not to mention the memorial aspect of it. The site also has more facts and personal stories (click a candle for a story). The number is currently at 420,192 candles, and when I was there a few hours ago, it was at 380,000+ so it's moving rather rapidly....good to see. I don't expect you guys to click all the links or read every bit of info, but if you're not already familiar with the basics, then at least take a minute or two to familiarize yourself, and if you are, then brush up on your facts. It'd be nice to take a second on the Light to Unite site in case they're still counting candles by the time you go through here.....and take another second out of your horribly busy life to acknowledge what's going on in the world out there, even if you're not directly affected. ~Edit~ One more. I had this link (Human.org) in with other things to blog, and when I ran across it again, it has a section specifically on AIDS, too. It just has a brief section on the Black Death, but it's the picture at the top that drives the point home. Real faces pop up on various parts of the world, names are listed on the same, and a running tally of how many people have died from it this hour according to the "one dies every 11 seconds" statistic. There are also other sections for "Problems of Poverty" including Hunger, Pneumonia, Diarrhea, Tuberculosis, Malaria, and Measles. Also, a side note...they have a page where you can print off a letter to send to the government of whichever country you want/live in (they have several for across the world). Guess how much money they ask you to send with it? A coin...even just 25 cents. Why? A coin makes sure your letter is opened and taken seriously, as someone must remove the money and forward it as international aid. In a small way, your donation helps your country reach or exceed the 0.7% goal. In a big way, your donation may give a person life. For instance, it costs the UN World Food Program just 19 cents to provide a nutritious meal to a hungry child, which may be the only meal the child gets that day. Your 25 cents can provide that meal and more.